This may be too much information so feel free to skip this post on my colonoscopy thoughts. LOL. Today is pre-colonoscopy prep day. I have taken the first step with is the Dulcolax laxatives. When I picked up my gallon bottle of whatever it is I have to drink, I picked up the Dulcolax and a bottle of Magnesium Citrate off the shelves because they were considered over the counter by my insurance company. No problem because they were only about $10 together. Does seem like the insurance company should pay the little bit when it protects them from paying for cancer treatments but for a total of $18 for 3 products, I won't complain. What I didn't know was that there was such a large array of laxatives and some came in boxes of 100. What? I've never had a problem in that area. Good to know there is one medical problem I don't have. Sorry if you do. So my preparation really began on Sunday. I started eating only easily digestible foods. I knew I could enjoy normal food but because of diabetes, I wanted to start cutting back to allow my blood sugar to slowly adjust to the no food day today. Soups and a little hamburger patty or chicken (insulin requires a combo of protein and carbs to work off) were main meals. My numbers have continued to be high since then. Not sure why but that is the mystery of diabetes. I had my last coffee this morning. Not supposed to have milk today but had creamer in my coffee anyway. The rebellious child that I am. If I'm going down, I'm going with a good cup of coffee behind me - Pun Intended. I bought Diet 7-Up to have on hand thinking tea and water would get old today. I wish I made some jello last night but didn't think of it. They told me to drink sugar water if I needed to correct my blood sugar so I'll have a little something sweet to get me through. I washed my sheets and bedspread today. I thought I might appreciate the smell of nice clean sheets when I get home tomorrow if I feel like napping. We have to be at the place at 5:15 a.m. That would be fine if I were in the hospital. They could wake me up to put me to sleep. Kind of miss the old days when you were checked in for everything. I've got the bathroom prepped. Full 24 pack of toilet paper. Don't think there could be that much in me after watching my intake all week but better prepared. I've also got the mop bucket full of water and a small pan to scoop water into the low flush toilet should I need it. Bought a new toilet bowl scrubber yesterday so the current one will be tossed after today. Hahaha. Could anyone be more overprepared for such a simple test? I just hope the doctor is good and awake at 5:15 a.m. I'm not excited about this test at the best of times but I hope I get to make sure she is awake before they put me to sleep. And since when did they start putting you to sleep for a colonoscopy? I'm not complaining, I just didn't know. It will be fine. Just wanted to share my silliness. 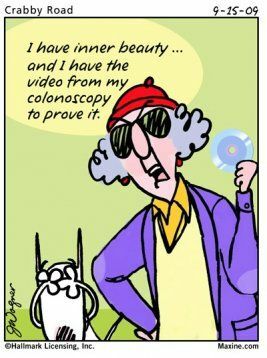 I've had many colonoscopies so I know the drill, LOL! Yes, Jello is considered a "clear fluid" and so is plain chicken broth which I always use so as to get in a wee bit of protein and nutrition during the fast. Technically, they don't put you "under" like a general anesthetic but they do pump you full of nice drugs so you're technically out of it almost as much. The drugs are always my favourite part. Did they tell you that you'll fart a lot after the procedure too, because they pump you full of air up the wazoo? So you've got that to look forward to as well. Have fun and I hope all is well! OMG. No they did not tell me that. Hahaha. I'd probably have been thinking I was dying when the gas attacked. My goodness this is a crazy business. They say its not like you really go under but let me tell you, when the medicine goes in I'm out immediately. The prep is so much worse then the procedure. I have yet to get all that stuff down. I just drink until I throw it up and then I'm done. Looking forward to hearing from you. It's okay to blog while farting. We wont know. Not one of my favorite things. I laughed at the crabby cartoon because my doctor did show me the picture of my colon after my last colonoscopy -- all pink and shiny (talk about TMI!) I say last colonoscopy because I plan never to do that again. I didn't have all the drama. I drank some stuff at 3pm and was in the john all night long. Then in the morning I had the ole rotor rooter and it was over. Had it in 2018 and they said not for another 5 yrs. Honestly? It's doubtful I will do this again. Sure hope it goes smoothly. Glad you have made it through the fasting part OK with diabetes. Lucky to have such an early time, less time to be hungry and anxious. Let us know. Hope all went well, Barbara. Nothing worse than colonoscopy prep. I have a friend with a genetic disease that puts her at higher risk of colon cancer -- she has to have the procedure done every year. The rest of us are pretty lucky!